Two white traditional type event fencing panels on the road. ?Materials: UV stabilizer, Titanium Dioxide additive, compounded PVC frame and fittings. ?Locking pins and hardware material: aluminum and stainless steel. ?Height: 42 in, 32 in. ?Weight: 27 lbs, 24 lbs. ?Distance between bottom rail and ground: 3.5". A white display type event fencing panel on the lawn. ?Display area panel (H × W): 30" × 20". 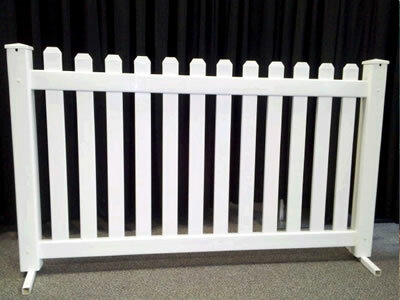 A white picket event fencing panel on concrete. ?Weight: 29 lbs, 24 lbs. A white lattice type event fencing panel on the ground. ?Weight: 28 lbs, 25 lbs. The shock cords connect the event fencing panels, we can see it when attractive caps are removed. ?Durable and good corrosion resistance. ?Shock cords connect the fence panels together. ?Pre-drilled holes at the base legs allow for swiveling without tools. ?Set up in a few minutes and no tools needed. ?Free maintenance and excellent UV resistance. ?Can be used for personal travel. Event fencing serves as a barrier for the garden. Two traditional type event fencing panels install next to the chairs and desks. A tent is set up next to them. Car boot sale ad details Event Fencing is a Temporary or Permanent Barrier for sale in Wigan. Event Fencing is a Temporary or Permanent Barrier available on car boot sale in Wigan. More Power saws for sale in Wigan and more second hand sale ads for free on 2lazy2boot - Wigan car boot fairs - 42208.